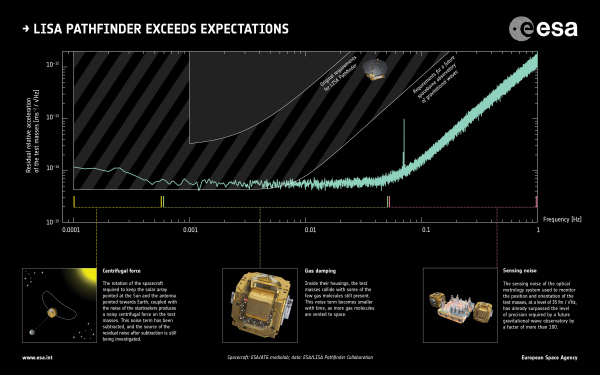 On 7 December, LISA Pathfinder started the extended phase of its mission, an additional six months during which scientists and engineers will push the experiment to its limits in preparation for ESA’s future space observatory of gravitational waves. LISA Pathfinder, a demonstration mission to validate important technologies to observe gravitational waves – fluctuations in the fabric of spacetime – from space, was launched just over a year ago, on 3 December 2015. After a six-week-long journey, the spacecraft reached its operational orbit around the first Sun-Earth Lagrange point, L1 – 1.5 million km away from Earth towards the Sun – at the end of January. There, following commissioning of the on board instrumentation, LISA Pathfinder started its science mission on 1 March. Much to the team’s surprise, it did not take as long as expected to achieve the mission’s goal: demonstrating that two test masses – a pair of identical gold-platinum cubes – can be placed in the most precise freefall ever performed. In fact, the desired level of precision was already obtained within the first day of LISA Pathfinder’s scientific operations. Over the following months, scientists and engineers kept improving the performance of the experiment. They described these first results, including an analysis of the residual sources of disturbance on the cubes’ almost perfect freefall motion, in a paper published at the beginning of June in Physical Review Letters. Then, on 25 June, the first operations phase, using the LISA Technology Package (LTP), was completed. The LTP is a European payload consisting of the test masses, inertial sensors, and laser interferometer, and uses a series of cold-gas micronewton thrusters to move the satellite and keep it centred on the cubes, in response to external and internal forces battering them around. Operations continued with NASA’s Disturbance Reduction System (DRS), an additional experiment which receives measurement input from the inertial sensors of the LTP but employs its own micronewton thrusters based on colloidal technology. Following completion of the DRS operations, the extended mission of LISA Pathfinder began on 7 December 2016, at 09:00 CET (08:00 UTC). It will last until 31 May 2017, making use of both the LTP and DRS payloads. Last October, ESA issued a call inviting European scientists to propose concepts for the third large mission (L3) in its Cosmic Vision plan, which will be a space observatory to study the gravitational Universe. The selection is expected to take place in the first half of 2017, with a preliminary internal study phase planned for later in the year. The future observatory will detect gravitational waves with frequencies from 1 Hz down to 0.1 mHz. 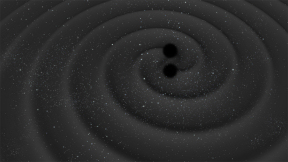 These are about a hundred to a million times lower than the frequencies of waves that can be measured with ground-based experiments like the Laser Interferometer Gravitational-Wave Observatory (LIGO), which obtained the first direct detection of gravitational waves in September 2015. 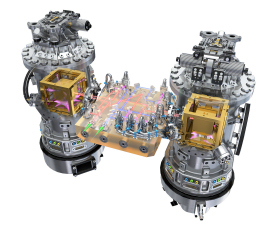 During the extended mission of LISA Pathfinder, the team will run a series of long duration experiments to better characterise the mission performance especially at the lowest frequencies that will be probed by the future observatory. “We are thrilled to be pushing the limits of LISA Pathfinder, a unique physics laboratory in space giving us confidence that we can definitely build a space-borne observatory of gravitational waves”, says Oliver Jennrich, LISA Pathfinder deputy mission scientist and L3 study scientist at ESA. One of the operations that will be attempted in the coming weeks concerns the station-keeping manoeuvres that mission operators have been regularly conducting to keep the satellite on its operational orbit. LISA Pathfinder orbits around L1, but if left unattended, it would slowly drift away from the Lagrangian point under the gravitational pull of Earth. To avoid that, it is sufficient to fire the micro-newton thrusters once every one to two weeks. Between 25 December and 14 January, however, the team decided to apply no correction manoeuvres. This will allow the scientists to run uninterrupted experiments for almost three weeks, exploring what happens in the range of very low frequencies that are of interest to detect gravitational wave from space. Another experiment concerns slightly higher frequencies, around 1–60 mHz. At these frequencies, the main source of disturbance seems to be gas molecules that are present in the test mass enclosures and bouncing off the two cubes – an effect that has been reducing as more molecules are being vented into space. The team is now curious to see whether additional sources of noise are lurking underneath, something that will be important for the future L3 mission. One possible way of testing this entails simply waiting until most molecules are vented into space, but there is an alternative: to switch off many of the heaters on board, reducing the temperature by ten degrees, and thereby reducing the pressure inside the enclosure. The team will run this experiment in late January. These are some examples of the range of experiments that will be conducted during LISA Pathfinder’s extended mission. Eventually, at the end of the mission, the spacecraft will be gently pushed towards a heliocentric orbit.